Ok. I know. 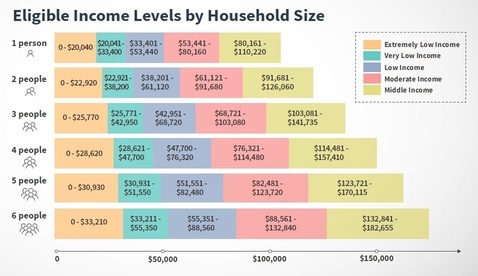 New York City (NYC) is an expensive place to live. However, in the bubble that is NYC, there always going to be some opportunities that not TOO MANY people know about. One of those resources that I don't think is super well utilized is NYC Housing Connect. In NYC, we have what is called a "Mandatory Inclusionary Housing" program that requires a share of new housing to be permanently affordable. You might be asking yourself... I probably make too much, am I eligible? Well, just look below, if you are a single person making less than $110,220, there are going to be affordable options for you. They are of course lotteries, but I have personally won myself (twice), so it is definitely possible. A few years back won a $1,700 studio apartment in a luxury high-rise in Hell's Kitchen and last year I won the lottery for a one-bedroom apartment in Stuyvesant town for about $2,800 per month. Obviously, the amount of rent that you pay is on a sliding scale and you can just turn down the offers that you don't want. Today, I'm kinda kicking myself for not taking that studio apartment in Hell's Kitchen, but I am fairly confident that I can win another one within a couple years. Pros: Saves money on rent and the website makes it easy to apply to multiple lotteries. Cons: Not for people who need housing immediately and sometimes even "affordable" can be relatively expensive (It's more about value).